In Johor, along Malaysia's East Coast, are a lot of locations favoured by vacationers seeking a more relaxed, nature-oriented holiday environment. The sea around Johor contain a colourful and fascinating variety of underwater life and offer visitors a wide choice of activities. Johor's offshore territory offers respite as well. It consists of a string of several clusters of small, idyllic islands dotting the South China Sea to the east of the Malay Peninsula. 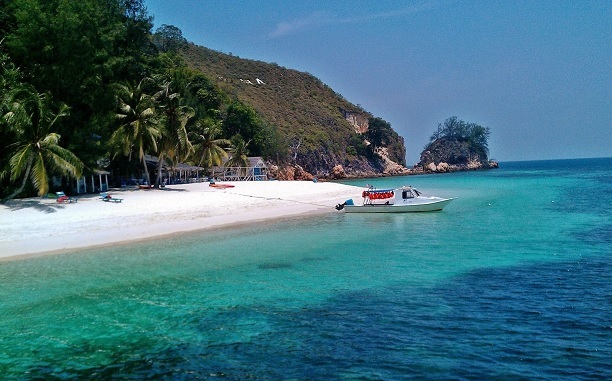 These islands lie in a small group just a short ferry ride from Mersing or Tanjung Leman. The availability of boats for hire makes island hopping one of the most enjoyable activities here. One of the most popular of the islands is Pulau Rawa, located sixteen kilometers off the coast. It is a beautiful island with white sand, coves, and superb clear waters for water activities. Comfortable chalet-style accommodations are available on the island, and equipment for recreational water activities such as snorkelling, diving, and fishing can be hired. Pulau Besar, just south of Pulau Rawa, is an outstanding destination. A full range of accommodation is available on the island. Between the two islands is Pulau Tengah, an uninhabited island nine miles from the Malay coast. During the 1970s, the island gained attention as a Vietnamese refugee transit camp, which was closed in the 1980s. In 1985, Pulau Tengah was one of the few islands designated by the Malaysian government as a Marine Park. The island possesses a remarkable abundance of marine life, including rare species of fish and coral. In July, giant leatherback turtles emerge from the sea to lay their eggs here. 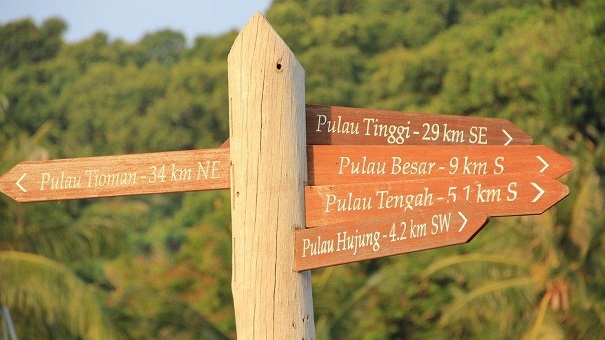 Pulau Tinggi and Pulau Sibu are the next islands, lying further south along the Peninsula. Like Pulau Tioman, its world-famous cousin, Pulau Tinggi has for centuries served as a shelter and stopover for traders plying the East-West spice route. This mountainous and largely uninhabited island is naturally endowed with fresh water, a sheltered harbour, fruits, rattan, and timber, as well as a some very fine beaches. Tinggi's long coastline of untouched white-sand, dotted with intimate coves, may seem reason enough to visit. However, the island also owes much of its fame to the vividly hued coral reefs, teeming with marine life, that sit offshore. Butterfly fish, angel fish, and black grouper, to name but a few, make this island an underwater photographer's heaven. Pulau Sibu is a refreshing hideaway. The island abounds with lush tropical vegetation and endless stretches of golden beaches, and offers facilities for snorkelling, diving, wind surfing, sailing, and angling. Pulau Sibu is reached by ferry from Tanjung Sedili. Pulau Sibu Tengah, located further south along the coast, has been developed as a rustic resort destination, offering a host of watersports activities, tennis, and even a discotheque. There is ferry service to the island from Tanjung Leman. Two other Johor islands, lying further from the coast, are Pulau Pemanggil and Pulau Aur. Pulau Pemanggil is a rather large and deservedly popular resort destination, noted for its abundant marine life and clear waters. Pulau Aur, a much smaller island to the southeast of Pemanggil, is famous for its unusual scenic beauty. Secluded lagoons and offshore pools make Pulau Aur an unparalleled destination for idyllic bathing.